Lafia – The National Broadcasting Commission (NBC) has described the demolition of the structures housing the Breeze 99.9 FM, Lafia as “shocking and unbelievable”. The structures were demolished on Saturday, May 20, 2017, by the Nasarawa State Urban Development Board (NUDB), over alleged violation of approved land laws. Mrs. Franca Ayetan, NBC Zonal Director for North-Central, who led a team on a verification visit to the destroyed station on Monday, said that the development was surprising because the station followed due process in obtaining its broadcast license. “The owner of the private radio station, Dr. Nawani Aboki, followed due process in obtaining the broadcast license after all necessary inspections were carried out. “On March 31, when we came to commission the station, the state government was fully represented. “If government had raised any reservation then, as a regulatory body, we would have waited a little more before inaugurating the station. But none was raised,” she said. Ayetan said the NBC would seek for justice in the matter, but promised to follow due process in doing that. The Director said that the commission, apart from being a regulatory body, had the mandate to protect broadcasters from any form of injustice or attacks. She commiserated with the owner of the station over the demolition, pointing out that the prime reason for deregulating the broadcasting industry was to give the people alternative voices to bare their minds. The official said that the NBC had been monitoring Breeze 99.9 FM broadcast and had never found a breach of the guidelines of the Nigeria broadcasting code. She said that the commission had never received any complaint from any quarters regarding offensive or inciting broadcast from the station, since it went on air on March 31. “We are sad that this is somebody’s investment being destroyed. We are also sad that a radio frequency serving as a platform for the airing of views has been destroyed. “A Frequency is usually given to owners of licenses to hold in trust for the people; this station has not abused that trust. It has served the audience diligently. “We will support the owner of the station to recover from this and continue,” she said. She urged the proprietor not to allow the voice of the people to die, saying that the main component of the station was not the physical building, but the voice and broadcast license. “That the structure has been destroyed does not mean you should stop broadcasting, given that advancement in technology broadcast has been made easy,” she said. Earlier, Aboki, the Executive Director of the station, had told the team that some officials from the ministry of lands had, on May 12, inscribed “show approval” message on the wall of the station. “We then met with them on May 15, where they raised the issues of my Certificate of Occupancy (C of O) showing `residential’, and suggested that the station should not be there. “We agreed at that meeting, based on their advice, that I should apply for ratification of the document only for us to see “demolition” inscription on May 19, before the structure was pulled down on Saturday May 20,” he said. Aboki said that the NUDB did not follow the procedural requirement for demolishing “illegal” structures, and insisted that government was yet to come out with the actual reason for the demolition. He, however, said that he would follow due process to seek justice over the incident. 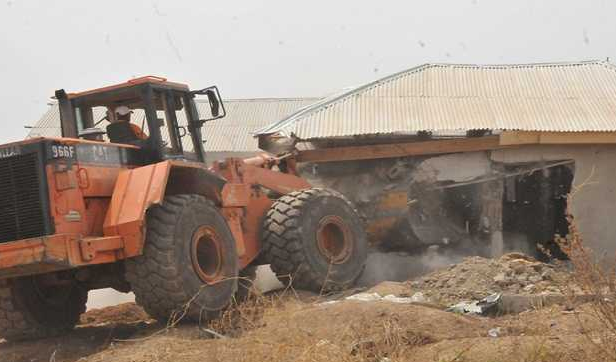 Mr Adamu Sule, the Managing Director of NUDB, has however that the radio station was among buildings demolished in the state capital for not complying with approved land laws. “We brought down the radio station because its structures did not comply with approved land laws,” he said.